Quality Inn & Suites - Hollywood Blvd & Port Everglades Cruise Port, a budget-friendly, full-service cruise port hotel in Hollywood, Florida, near Port Everglades cruise port and the Fort Lauderdale/Hollywood International Airport (FLL), has recently completed extensive renovations to the guest rooms, landscaping and outdoor pool of the hotel. All guest rooms in the boutique cruise hotel now feature new Interia Hospitality™ furniture, Serta™ mattresses, knockdown textured ceilings and walls, LVT wood flooring, ceramic tiles and eco-friendly LED lighting. Entertainment for guests has been upgraded with high-speed, 100GB internet service and 40" and 50" flat-screen HDTVs featuring over 80 channels of High-Definition programming. Door locks have been upgraded to RFID locking mechanisms. To accommodate guests seeking to enjoy South Florida's world-famous sunshine and tropical weather, the pool and surrounding area of the hotel have also undergone extensive renovations and upgrades. The renovation culminates a busy time for Quality Inn & Suites - Hollywood Blvd & Port Everglades Cruise Port, as the hotel prepares for the peak of the South Florida cruise season. Welcoming guests from all over the world, this Hollywood, Florida hotel specializes in vacationers departing from Port Everglades and the Port of Miami cruise ports, those attending sports or entertainment events at the recently upgraded Hard Rock Stadium, or simply vacationers looking to enjoy South Florida's sunny, tropical climate and pleasant weather as temperatures dip down in the northern states. "We are very excited to usher in the cruise seasons with these new upgrades," stated Izzy Fintz, Hospitality Manager at Quality Inn & Suites - Hollywood Blvd & Port Everglades Cruise Port. "We take pride in being able to provide an award-winning, budget-friendly hotel experience for our guests, and take every opportunity to upgrade and improve our hotel to better serve our guests' needs." In accordance with the Value Qs guidelines of the Choice Hotels Quality brand, Quality Inn & Suites - Hollywood Blvd used exclusively Quality-approved vendors to complete the renovations, including Sherwin Williams™, Startex Industries, Guest Supply, MicroFridge / Danby™, EVERSTEP™, HD Supply, ASSA ABLOY Hospitality and Moen™. 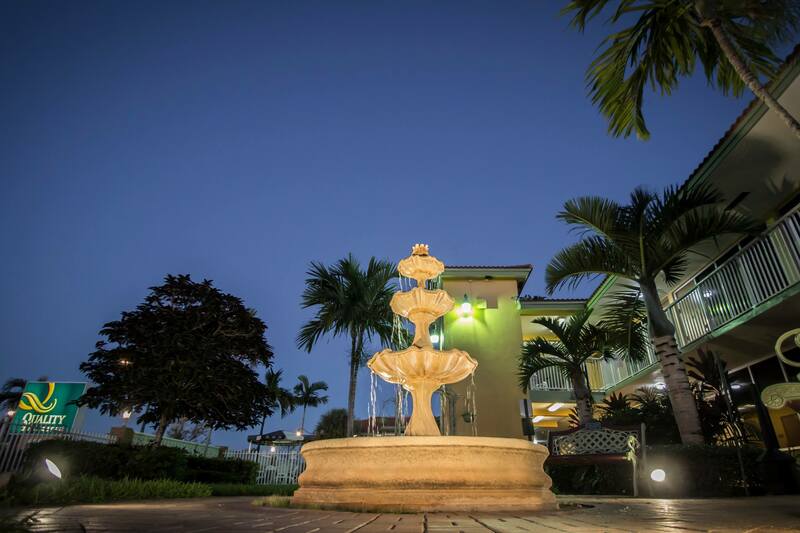 Quality Inn & Suites - Hollywood Blvd & Port Everglades Cruise Port is a recipient the White Glove Award from the Superior Small Lodging Association (SSL) for outstanding cleanliness and service, and the AAA award for the best hotel in Hollywood, Florida. Quality Inn & Suites - Hollywood Blvd & Port Everglades Cruise Portis a budget-friendly, pet-friendly boutique Hollywood, Florida hotel in close proximity to popular South Florida tourist destinations such as Hollywood Beach, Fort Lauderdale, Miami, Port Everglades cruise port and the Fort Lauderdale/Hollywood International Airport (FLL). Located on Hollywood Blvd, just minutes from the beach, this Hollywood cruise hotel is a perfect destination for families and cruise vacationers. The hotel's proximity to the Hard Rock Stadium makes it a perfect destination for fans of the Miami Dolphins™; and Miami Hurricanes™; football. Guest services include shuttle transportation to the airport and cruise port, long-term cruise parking, complimentary breakfast, heated outdoor pool, whirlpool tub suites and Wi-Fi. For more information, visit www.hotelhollywoodfl.com or follow the hotel on Facebook. Quality Inn & Suites - Hollywood Blvd & Port Everglades Cruise Port is a member of Choice Hotels International, Inc.® (NYSE: CHH).